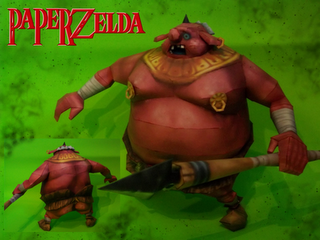 In Skyward Sword, Moblins appear as large, overweight, red monsters that are twice the size of Link, resembling Big Blins from Spirit Tracks and King Bulblin from Twilight Princess. Moblins begin to appear after Farore's Silent Realm Trial is completed. They appear in Faron Woods,Lanayru Desert,Volcano, Skipper's retreat, the Sky Keep, and the Horde Battle.